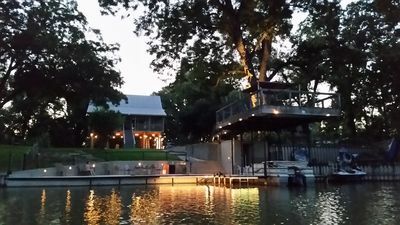 Beautiful condo on the Guadalupe River with amazing views! 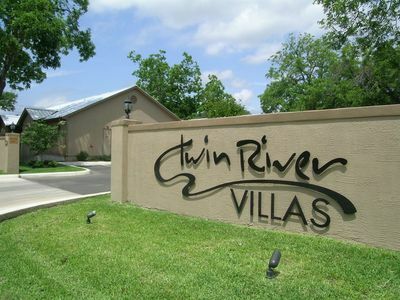 This newly built 2/2 condo has direct river access and a pool! 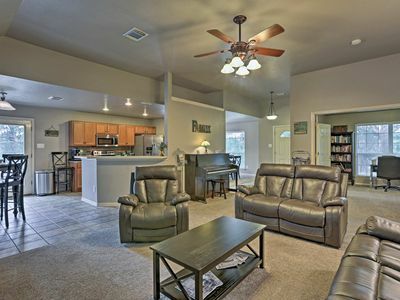 This condo has ample room for your family to cook meals, watch TV, or play games. 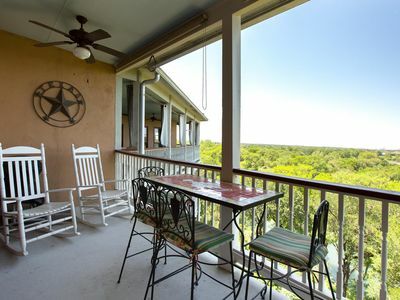 Enjoy riverfront views from the living room and balcony with comfortable seating and a propane grill. 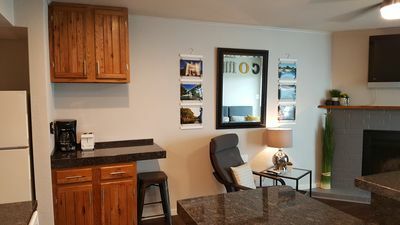 Fully equipped kitchen, flat screen televisions, Roku, free internet, and washer/dryer to add to the comfort of your stay.This complex has covered parking for one vehicle and an elevator. 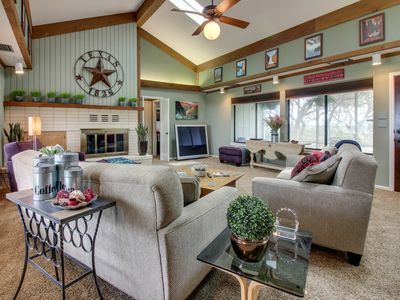 The open living room/dining room is a great place to relax after a day on the River. 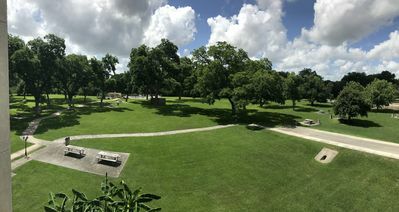 Enjoy a cup of coffee or a glass of wine on the patio while taking in the scenic views.The dining table has seating for 4 and 3 additional bar stools at the breakfast bar. Get a great night's sleep in the comfortable Queen size bed in the master with an attached full bathroom. The second bedroom has two full size beds and is just steps away from the second full bathroom. All of the beds have premium sheets and bedding for a restful night's sleep and the bathrooms are fully stocked with all of the linens you will need to make your stay easy and enjoyable. This condo sleeps six comfortably. 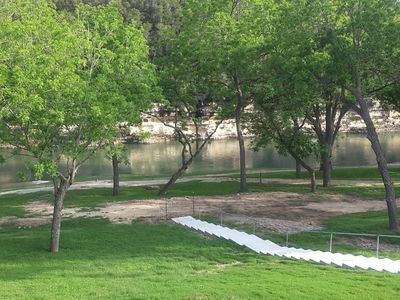 Relax on the riverbanks and watch the tubers float by, do some rafting, kayaking, canoeing, fishing or jump in the river right from your backyard. You can rent tubes and get shuttle service right next door at Rio Guadalupe Resort. On Saturday nights in the summer, the complex has live music out on the backyard patio for you to enjoy! This amazing condo has everything you need to have a perfect vacation. 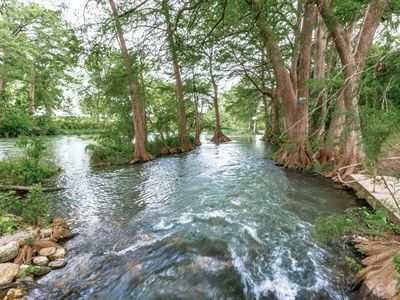 If you want to venture out, visit Schlitterbahn, (less than 15 miles away) or spend the day in Gruene, shopping, visiting the wineries or dancing the night away at the infamous Gruene Hall. 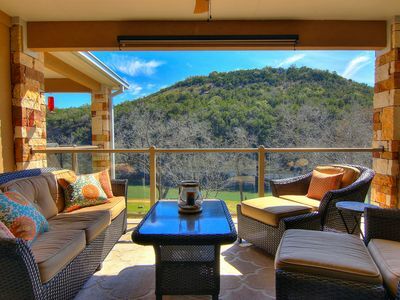 Natural Bridge Caverns, and the San Marcos Premium Outlets are a short drive away. 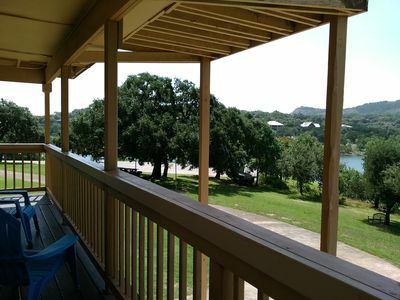 Canyon Lake is less than 5 minutes away where you can rent boats or jet skis. The whole area is full of small music venues like Whitewater Amphitheater (less Than 5 miles away). Maybe your ideal vacation is all about fly fishing. 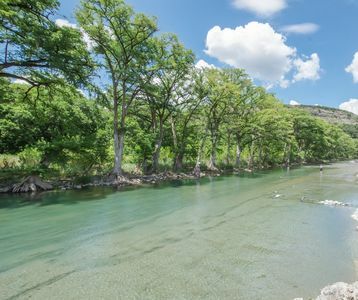 Did you know that Texas Parks and Wildlife and Guadalupe River Trout Unlimited stock this area each winter with rainbow and brown trout? 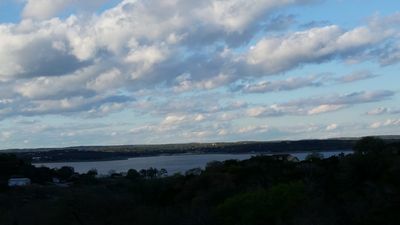 January and February are prime fishing months here. . We enjoy spending time in the Hill Country and want to share it with you. We hope you enjoy it as much as we do! This condo is on the third floor so the views are fabulous and it does have an elevator. 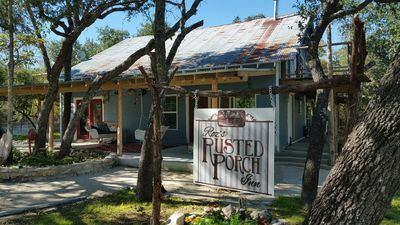 Guests must be 25 years of age or older to make a reservation and must be staying at the property. 2 parking passes and 6 wristbands provided. No trailers allowed. No portable grills or open flames. No smoking. No pets allowed. Family friendly condo with no tolerance for profanity or vulgar music. This condo has a maximum occupancy of 6 guests. This maximum occupancy is not to be exceeded at any time. No daytime guests allowed. 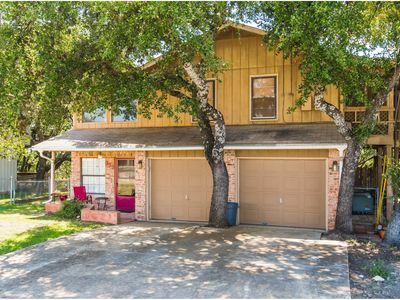 Family lodging near Schlitterbahn, Downtown, and the Water"
Perfectly secluded dog-friendly home with majestic covered deck! 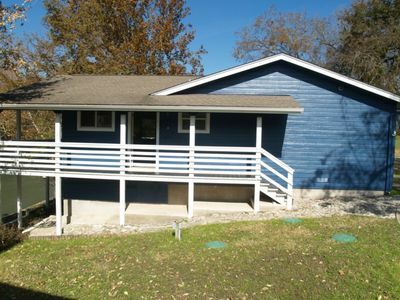 Newly Renovated 2BR 2BA, walking distance to Downtown, on the Comal! 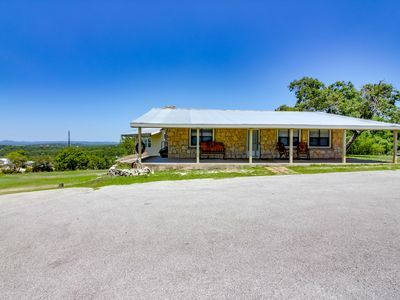 Spectacular views, quiet surroundings, nearby vacation activities! 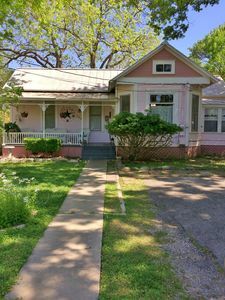 Quaint and Cozy Victorian Home, Close to Gruene, Schlitterbahn, and Downtown! NEW! 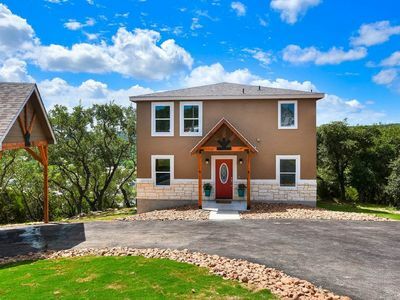 'The Hill' - Canyon Lake Home on 2.5 Acres! 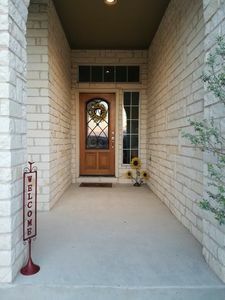 Guadalupe Dew Drop Inn- 2bdr/2bth- SLEEPS 8- WALK TO SCHLITTERBAHN! 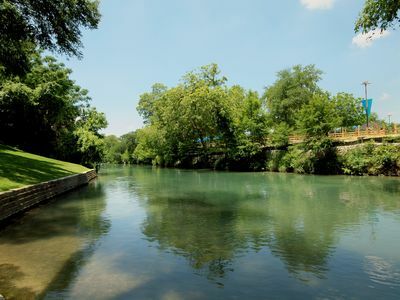 Riverfront View - 2Br/2Ba on the Comal River with private river access!